I have no easy answers for any of it, but I have made a study of a number of plays that have dealt with the conflict between Mormonism and homosexual lifestyles and tried to grapple with the conflict between these two cultures in the best way I can. Searching through these plays has been at times uncomfortable, often challenging (in both the positive and negative aspects of that word), and at choice moments even enlightening and inspiring. However, it’s made me doubly sensitive to how Mormons are represented in such stories, as well as tender hearted towards those who are caught between the monoliths of these cultures, especially those who identify with both. There have been few issues attached to the LDS Church that have been so divisive and emotionally charged as the conflict regarding homosexuality. Like many other Churches that claim to be an heir of Christian and Biblical traditions, the LDS Church has often throughout its history championed theological claims that run against the hopes and aspirations of the LGBTQ community. In Mormonism the concept of “eternal families,” is especially problematic to gay individuals. In the LDS Church, family is a defining characteristic of those in the highest degree of heaven, and those relationships which have been sealed by priesthood authority here on earth will continue in the after-life. Thus, according to current Mormon theology, spouses, mothers, fathers, children”¦those relationships will continue into the after-life. Although this is a comforting thought to those with happy family lives here, it has often created a strong tension between the Mormon faith and the gay community, for that eternal family in Mormon theology is currently drawn as a strictly heterosexual model. Such a heated fight between these two influential, but conflicting worldviews effects no one so personally and tragically as those who desire to claim stake in both communities–those who identify themselves as both gay and Mormon. That conflict (both the macrocosmic conflict between communities and the microcosmic conflict within individual souls) has been reflected in the representation of the Church in the world of Theater through a whole grouping of plays from playwrights both within and without the Church. Consequently, Mormonism has been a prominent target and topic of conversation within the theatrical community for a few decades now, in large part because of its public stances on homosexuality and gay marriage. Due to this, and in large part because of its historical connections with the LGBT community, the theatre community has not been soft nor shy about its commentary on the Mormon faith, nor particularly flattering in how they represent this particular religious minority. Ranging from the satiric, to the political, to the soulfully heart breaking, some of these “Mormon” plays are now mainstays in the theatrical canon. Plays like Angels in America, The Book of Mormon Musical, Bash: Latter-day Plays, and Confessions of a Mormon Boy, have played to international attention. Mormons haven’t shied aw ay from representing themselves either, with a healthy, if not insular, bedrock of plays that makeup the library of Mormon Drama. They often play only to intimate audiences in Utah, having little influence outside the Mormon theatrical community. And Mormon dramatists and theatre artists have been having their own conversation about issues of same gender attraction. Local, intimate plays like Little Happy Secrets, Facing East, and Wings of Wax have mainly played to Utah audiences (the exception being Facing East, which had notable runs in San Francisco and New York). The Church’s involvement in rallying against gay marriage in the Proposition 8 brouhaha in California; sometimes insensitive comments from high profile Church members; and local excommunications of gay members (if they are engaged in sexual activity); have made a headache for the Church’s PR department, and have caused deep concern for many of its members, especially those who are gay themselves or have loved ones who are gay. Since the fallout of Prop 8, there has been some softening from the Church on the issue. The rhetoric has become more compassionate from leaders like apostle Elder Jeffrey Holland and even from members of the First Presidency like Dieter F. Uchtdorf. There was also a kind of good will tour from Church seventy and Church Historian Marlin K. Jensen, who expressed great concern for the issues confronting the Church’s gay members in the last couple of years (he touched on the issue even at one of the stake conferences I attended in Arizona, advocating for greater kindness and love, and there was an especially significant meeting he had in California with members who were gay, or those who had other personal stakes in the issue, including playwright Carol Lynn Pearson). Yet it is still a lightning rod for the Church in the public sphere, and a heartrending, personal issue for many in the Church’s ranks. A couple of the more high profile plays which have tackled the conflict between Mormons and the LGBT community include Tony Kushner’s Pulitzer Prize winning drama Angels in America and a specific song (“Turn it Off”) from Trey Parker, Robert Lopez and Matt Stone’s Tony Award Winning The Book of Mormon Musical. Both of these plays are written by non-Mormons whose interaction with the Mormon community in general has been minimal, and it shows. 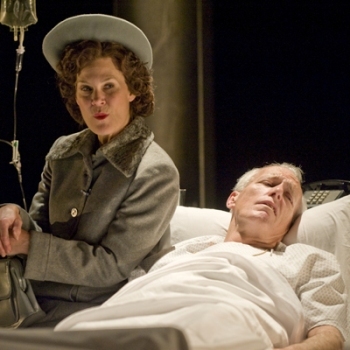 In the case of Angels in America, its Mormon characters are generally well drawn, dynamic individuals. Yet, with perhaps the exception of the devoted Mormon mother Hannah Pitt (who travels to New York to help her son Joe after he comes out to her out as gay), very few of the Mormon characters actually seem, well, Mormon. Even accounting for the fact that Mormons come from many different backgrounds and have struggles and vices just like any other person, there is something “off” about Kushner’s portrayal of Mormonism through characters like Joe and Harper Pitt. Joe Pitt makes some moral stands against the corrupt Roy Cohn, then questionable capitulations, which strike to me as good characterizations of a flawed Mormon who is swinging like a pendulum between various, conflicting aspects of his identity. Yet there are these odd moments, like Joe casually referring to his temple garments as a “second skin” (at least Kushner didn’t have him referring to them as “magic underwear”–I am about sick to death of that disrespectful, ignorant mischaracterization! ), which, culturally speaking, are simply off. In genera l, Joe’s weakness, his confusion, his self-loathing, his hypocrisy are definitely qualities that can be found in some Mormons. And his good qualities of sensitivity, intelligence, and emotional feeling are also things that can be found in many Mormons. But these are universal characteristics that can be found in human nature, not the specific cultural quirks that should round out a character’s back story. There is a bedrock of culture (with its positive and negative dimensions) that is found in Mormons (and even specifically in Mormon men) that is entirely absent in Joe’s character. Little quirks and details that may seem small, but which would flesh out how the Mormon culture has effected Joe. Kushner has a decent grasp on the Republican side of Joe, how that has affected him, as well as Joe’s own individual personality and quirks, but he’s still wobbly on the Mormon side of Joe. I don’t even know what to make of Kushner’s characterization of Harper Pitt–she’s so unlike any Mormon woman I’ve ever known. I know Harper is supposed to be neurotic, high on pills, and is supposed to come from a rough background–what drew Joe to her was her broken and fragile nature, after all–but I believe in trying to sell these points, Kushner has over exaggerated her for the sake of the world of his magical realism. She is a flat character overall, with only a few spare moments here and there that flesh her out in any major degree. Harper is a child-like (but not so interesting), broken (but constantly unrelatable) character for sure, but we never get beyond the fact that she is hopped up on pills and feels rejected by Joe. The wild, dream-like places Harper visits in her chemically (sometimes spiritually?) induced state, are always more interesting than the character herself. I find none of the vibrant inner life in Harper that I have found in the multitude of Mormon women I have known (even the “broken” ones), as Kushner seems to be trying to oversell the oppression of Mormon women to the point of making Harper a complete ghost of a character. That’s not any of the Mormon women I know (even the oppressed ones). PRIOR: A vision. Thank you, Maria Ouspenskaya. I’m not so far gone I can be assuaged by pity and lies. HANNAH: I don’t have pity. It’s just not something I have. (Little pause) One hundred and seventy years ago, which is recent, an angel of God appeared to Joseph Smith in upstate New York, not far from here. People have visions. HANNAH: It’s not polite calling other people’s beliefs preposterous. He had a great need for understanding. Our Prophet. His desire made prayer. His prayer made an angel. The angel was real. I believe that. PRIOR: I don’t. And I’m sorry but it’s repellant to me. So much of what you believe. HANNAH: No you can’t. Imagine. The things in my head. You don’t make assumptions about me, mister; I won’t make them about you. In this passage, Kushner shows some insight into what is the flaw of so many secular people who try to comment on Mormonism (even Kushner himself)–they really have so very few informed insights into the culture. More importantly they have litle experience or understanding with the individual psychology, opinions, and inner life that all Mormons carry around within them, even about huge politically charged issues like homosexuality. There may be many who are surprised by just how many Mormons don’t fit in their preconceived boxes. So often Mormons are represented as people with plastic smiles and plastic personalities, so devoid of real life and passion that we’re dehumanized, much like the Mormon pioneer mannequins that Prior and Harper encounter in Angels in America. One gets the sense that Kushner’s research on Mormons may have been superficial, especially with the epitome of the Mormon experience being represented in a scene of mannequins in a visitor’s center. Although a visitor’s center may be part of the public face the Church may put out to the inquisitive, one has to get to know a wider sampling of the Mormon history, culture and membership to get to a better bearing as to the richly complex factions and alliances and triumphs and personal pains that come with being a Mormon. But that distance caused by ignorance is helpful sometimes, especially to secular pundits who want to paint Mormons in a bad light and use Mormons as a political talking point instead of seeing them as a vibrant culture made up of unique, interesting individuals. Especially in the light of conflicts like the battle for gay marriage, making Mormons seem foreign, weird, suppressed and unrelatable is a political plus, it’s good strategy. In the above passage, Kushner transcends that tendency (a tendency he subtly shows in other places), if even for a moment, and lands upon a greater truth. None of us truly belong solely to the monoliths. Our struggles are personal struggles; our visions, personal visions. But not even Kushner can escape the tendency to subtly exoticize and distance Mormons from what he considers the rational and the mainstream. However, Hannah Pitt, again, is the exception to this tendency in Angels in America’s representation of Mormons. But even with her there is a purposeful push to de-Mormonize her (at least culturally) by the end. 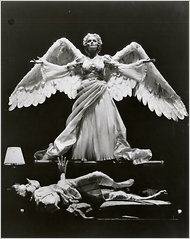 Throughout the story, Hannah is drawn as a strong individual of conscience, compassion and common sense, but in her last appearance in Angels in America during the Epilogue, Kushner describes Hannah in the stage directions like this: “Hannah is noticeably different–she looks like a New Yorker, and she is reading the New York Times“ (p. 277). This is subtle, but here Kushner erases many of the cultural identifiers that made Hannah Mormon, showing that to make a Mormon relatable, he wants to make her more like, well, him. By the end, she is not that Utah wacko. We’ve related to her throughout the play, seen her as a good person, so Kushner’s got to erase the Mormon identifiers and make her just like “us” (the supposed audience for Angels). She is like the rest of “us” reasonable secularists–and dresses like a New Yorker to boot! The brilliant Kushner, however, at least pushes for nuance and complexity in his characters, Mormon and gay. That can hardly be said of Parker, Lopez and Stone’s Book of Mormon Musical. The Book of Mormon Musical is broad (at times inaccurate) satire at its most flagrant. Yet it does have its moments of “affectionate” playfulness with its Mormon missionary protagonists, where it (condescendingly) colors them as well intentioned do-gooders who (by the end, knowingly) propagate a system of falsehoods because it (in the end) helps people with their social and political problems and makes them better people. Yet in getting to that well meaning, but somewhat insulting point (I for one believe in the actual Book of Mormon because I believe it’s true, literally and metaphorically. And I feel I have good reasons to believe so), the creators of the musical paint the Mormons as a rather ridiculous bunch. They punch up every odd doctrine or changed policy they can think of, while ignoring the more revolutionary and sensible doctrines such as a tiered, more inclusive heaven or a Heavenly Mother (because they would, you know, make us look more interesting and progressive). But, really, they could have come up with at least 50 more quirky things, if they had actually done more in depth research, instead of leaning on the old reliables of the blacks and the priesthood change, the “Garden of Eden in Missouri,” and “God lives on a planet” staples. All the while Mormons are painted as hopelessly naÃ¯ve when it comes to LGBT issues in the song “Turn it Off,” even as Church leaders and membership have become increasingly sophisticated and compassionate in the way its transforming regarding the issue. And, of course, there are those plastic smiles. Those smiles are the “Mammy,” of Mormon representation. There is a stereotypical “gee, golly” naivetÃ© which Parker, Lopez and Stone bring to nearly all their Mormon characters, even the supposedly more sophisticated ones. They color Mormons as uninformed, out of touch, “in their own separate universe” while the rest of the world is dealing with reality, which does not gel with the experiences I have had as a Mormon, and I know of many, many others who feel the same. Despite its many Tony Awards and super catchy tunes (I can hear the wonderfully infectious tunes of “Hello” and “Turn it Off” in my head even now), I have a hard time with how Mormons are portrayed in the musical, despite its supposed affection for my culture. To me it rings of the kind of condescending and insulting affection that was directed towards African-Americans in 19th and 20th century minstrel shows. Many will say that I’m overreacting with such comparisons, that the musical is a satire. Well, so were the minstrel shows. Of course Mormons are guilty of their own misrepresentations, especially when it comes to LGBT issues. I was, however, surprised not to find any flagrant attacks against the gay community in any of my research of Mormon drama (I guess you may have to go to some of the political blogs to find those kinds of comments). Perhaps it’s because the Mormon theatre community leans a little more moderate-to-left than much of the Mormon demographic. Or perhaps it’s because Mormons know what it’s like to be attacked on stage, while paying to sit silently in the audience. Or perhaps it’s because Mormons have learned to be quiet on the subject, considering the often volatile reactions they have received in return. Whatever the case, what I actually found in Mormon drama (which, in this case, I’m defining as drama written by Mormons, largely for Mormons, although there are many other ways to categorize it) was quite the opposite of what I’m sure many would expect. Here I have found a rich mine of compassionate and personal plays that resonate on a very deep and human level. The best of these plays are deeply empathetic and aren’t ready to pass out easy answers, all while delving into what it means to be gay and Mormon. There have been excellent plays written by former Mormons, such as Stephen Fales’ Confessions of a Mormon Boy or Julie Jensen’s Two-Headed, whose authors, failing to find sympathy for their lifestyles and worldviews among their former Mormon culture, have sought affirmation and support from the larger secular culture beyond their former cultural borders. These are insightful and incisive plays that deserve attention. Then there’s Neil LaBute, a former Mormon convert, who got disfellowshipped (but not excommunicated) from the Church for his Bash: Latter-day Plays. That grouping of short plays presents a group of killers, all of whom are subtly implied as being connected to Mormonism in one way or another. One of those killers is a man whose violent tendencies culminate in the brutal killing of a gay man, aided by a group of his friends. Despite its disturbing nature, I thought it was an important play, if not very representative of any Mormons I personally know. Yet that’s LaBute’s style, to criticize and reveal the most brutal, twisted and excessive of human instincts”¦which Mormons are as prey to as anyone else. In bringing them to the light of day, LaBute seems to hope that it will help curb those instincts. The play, like most of LaBute’s work, plays out like a dark morality tale, and I’m very sad that this one led to his break with the Church. Yet there are two plays by Mormon playwrights that have shed a great deal of light for me with their humane, compelling and heartbreaking insights into Mormonism and homosexuality. Little Happy Secrets by Melissa Leilani Larson and Wings of Wax by Robbie Pierce both zero in on very personal stories of characters who are gay and Mormon. These two plays are unlike Angels of America’s macrocosmic political commentary. They are absent of The Book of Mormon Musical’s snarky, broad satire. There is no desire to divorce or punish the LDS Church, like in Confessions of a Mormon Boy or Two Headed. There is no exposÃ© of the dark underbelly of human nature, like in Bash. So, although Wings of Wax and Little Happy Secrets may not seem as ambitious as those mentioned above, they are by a long stretch more effective in representing what it means to be gay and Mormon, and the great tension that comes with trying to come to terms with both aspects of that identity. TOBY: Don’t tell me what you’re thinking. I know. Half of you are thinking, “This kid needs to get out of his religion.” And half of you are thinking, “Uh-oh, here comes the liberal propaganda.” Do you want to know what I’m thinking? I’m just hoping I survive all of this. I want to fly under the radar. Live my life (p. 7). JAMES: Toby, I’m not trying to push you. I’m trying to help you choose whichever side is best for you. TOBY: (nearly in hysterics) Choose? No, please, be smarter than the rest of them, Dad. Try to understand me. Choose to not be gay any more? I prayed for years that God would give me a miracle. I made myself sick fasting for it. And nothing. And you don’t believe that’s a choice, anyway. So when you tell me to choose, you obviously mean choose to stop being Mormon. Right? TOBY: –As long as it makes me happy. By which you mean leave the church. That option is just as impossible, Dad. Being a faithful Latter-Day Saint is just as much an immutable, intrinsic part of who I am as being gay. I can no more shed my religion than I can my sexuality. I know my life would be easier if I stopped believing. But how do you stop believing something? Try it right now! Stop believing something. I’ve seen too much to stop now. TOBY: And turning your back on all these things that once were held sacred. JAMES: I just want you to be free. TOBY: If you’re going to be of any help to me, you’re going to have to change your tack. Even if I felt it were possible to change what I believe, I wouldn’t want to. I am fiercely, desperately Mormon. I need a solution that doesn’t ignore that (p. 22-23). In Melissa Leilani Larson’s Little Happy Secrets we get a similar dilemma with our protagonist Claire who is a faithful Mormon lesbian. Much like Toby’s story, we find Claire not representing the universals of her two communities, but rather the particulars of her personal life. Yes, she is Mormon and she is homosexual, but we also discover her personal, specific qualities. She loves Jane Austen novels and drinks in BBC period dramas. She likes the restaurant CafÃ© Rio. She has an overactive sense of guilt. She served as Mormon missionary in Germany (and it wasn’t the best time of her life). Sometimes she gets desperately sad. She feels that God communicates to her through revelatory feelings, in warmth, in assurances. Her favorite show when she was six was Thundercats. And she is secretively, longingly in love with her best friend Brennan. But Brennan is dating a man named Carter who Claire believes is all sorts of wrong for Brennan. Thus we get a clear sense of Claire throughout the play. Her voice, her tastes, her moods. She, too, is a fourth wall breaking character like Toby, inviting us to get personal, to draw near to her and discover the intimacy of her thoughts. She, too, feels torn about her identity, not represented by two competing universal ideologies that are out to conquer the world (such as we get the sense of in a play like Angels in America), but rather by two conflicting, very personal, inner desires–her desire to be one with God, and her desire to always be with the love of her life Brennan. Claire’s world is very private, very quiet, uneventful, even cloistered. She’s not attached to “groups.” Brennan is a strong Democrat and Carter is a strong Republican, but we never hear Claire label herself politically. Even in her religious life, Claire is not defined by her involvement with the Church or the Mormon community, but rather she talks about her personal relationship with God. So to her, her world is defined by two personal relationships–God and Brennan are her everything. And the presence of a single man, Carter, threatens an entire half of that world. With two such clear voiced individuals, Toby and Claire, Pierce and Larson go beyond political movements, gender communities, and even the hierarchy and organization of the LDS Church itself. And by going beyond, I suppose I mean that they go inward rather than outward. In this way characters like Toby and Claire take away the political machinations or broad satire or sweeping condemnations of many of the more well known plays that deal with Mormonism and homosexuality and leave only individuals who are striving to make sense of their lives, their desires and their relationships, and counting the painful cost of their losses. Playwrights like Pierce and Larson are showing the universal through the particular, showing that both Mormons and homosexuals are really just people with their own private struggles and private wars and private desires and private thoughts, not pieces on a chess board to be moved by the big parties and powerful movements. Thus oversimplifications or demographics simply don’t matter here. As we progress along in their stories, and find out the often devastating destinations of their individual paths, it is not the political points being brought to the forefront we care about (for we’re not really thinking about broad politics at this point), but it is Claire and Toby as individuals (even friends) that grip our attention, and make us care deeply about them and their story. I had not heard of Wings of Wax. Thanks for bringing it to my attention, Mahonri. And it seems to me that you have the beginnings here of a slightly longer essay for Dialogue or maybe even BYU Studies. Oh, also: I agree with your critique of Angels of America. And I think it’s one that is valid while still recognizing that overall it’s a brilliant play. A very nice write-up, thanks. Very interesting. One of the things I get from my reading of Northrop Frye is how drama describes the relationship between individuals and societies, with tragedy depicting separation, and comedy (in general) describing integration with society. Though of course, when the point is a critique of a society, and different societies get involved, then deciding what genre is involved gets complicated and often political. I think you right in your analysis of “Angels in America,” although I think Kushner succeeds more in that play than we give him credit for. (I’d say, for example, that he mostly succeeds in his use of Mormonism and mostly stumbles in his characterizations of them.) One problem I have with the play is its characterization of Joe and Harper, who wouldn’t be so bad as Mormon characters if they weren’t put on stage–as I think they are–and typical Mormons. That is, I think Kushner means for them to stand in for all Mormons in general, and that bothers me. And even if he didn’t intend for them to be that way, they come across that way regardless. Like you, they do not resemble the majority of Mormons I know–and I’ve known a few in my life. I’m also bothered by the transformation of Hannah into a New Yorker at the end of the play. The sense I get is that Kushner is trying to create a diverse utopian-American space for the new millennium, but really he’s simply erasing the differences that make Hannah an interesting character. (But, at least the Mormons made the cut, right?) I’m also not a fan of the scene that introduces Hannah–where she’s looking over Salt Lake City, sharing a cigarette with her friend (a sister in the church? a Catholic sister? ), and talking about the low intelligence of the people in the city. It’s a cheap potshot to me and undercuts what would otherwise be a good Mormon characterization. I’m not too familiar with the other plays you present here, although if we were talking novels, I could bring in some insight. At any rate, I imagine you left out a few plays (Eric Samuelsen’s, for example) for the sake of time and space, but the impression I get is that there is a lot of lit out there that addresses the Mormon/LGBTQ issue and very few who know about it. I know that people have tried to peg homosexual tendencies on David Hyrum Smith, but I think Valeen Tippits Avery’s book on him gets it right by attributing to his close friend, but not to him (although I would be open to him being bi-sexual?). His good friend, though, (the name is escaping me at the moment) was definitely in love with David, but it’s David firmly but kindly discouraging that kind of pursuit in his letters that makes me lean the way I do in my opinion. A person could definitely make a case out of it, though. Also, your concern that Kushner is using Joe and Harper as “stand in” characters for Mormonism (and them DEFINITELY not resembling Mormons) I think is very important. Kushner somewhat points out Harper’s atypical background, by saying she had it kind of rough and that Joe was attracted to her vulnerability and the possibility of being her protector, but Kushner is playing on such a macrocosmic level that it’s impossible for me not to see these characters as a kind of universal representation of Mormons–which they are most certainly not. “At any rate, I imagine you left out a few plays (Eric Samuelsen’s, for example) for the sake of time and space…” Yep. Although now that I think about it, I should have probably at least a mention of Samuelsen’s Borderlands. It’s an interesting play. I totally forgot to include Hannah’s random draw on a cigarette! Again, Kushner’s attempt to de-Mormonize Hannah, making her somehow more akin to someone he could recognize in himself and his culture. Kevin, that’s an interesting breakdown of the roles those literary forms take! William, yeah, Angels in America is a problematic play, but there’s no question that it’s brilliant. There’s parts of it that I totally love, and other aspects to it that I think are totally hypocritical. But Kushner has made it completely clear in his essays that he is, above all, a political writer and that things like accuracy, moderation and fairness are not what he really cares about. He believes it’s all about arguing your side. Where ideology trumps accuracy, there follows demagoguery and extremism. As you may recall, I wrote something several years ago for Irreantum talking about Mormon elements in Angels in America, including ways I thought he missed the mark dramatically by portraying Mormons as (mostly) generic conservative Protestants. (I reposted my article here: http://www.langfordwriter.com/blog/?p=139). I remember wondering at the time how much my reaction was affected by the fact that I was reacting to words on a page, as opposed to a viewed performance. (I’ve never actually seen the play[s] performed.) For example, the “second skin” reference worked for me because I saw it as metaphoric, not intended to represent regular Mormon speech patterns. On the other hand, I wound up feeling like as a Mormon reader, I had invested more meaning in that scene than perhaps Kushner intended, viewing it as a sign of profound pain and inner conflict. I wonder how my interpretation of that scene might have been different if I had been reacting to a performed version of it. I also have to say that I don’t find Hannah terribly persuasive as a mainstream Mormon, even before her apotheosis into a modern New Yorker. The phrase, “His prayer made an angel,” sounds to me like she’s justifying her belief as describing a psychological but not tangible reality. All that in addition to the initial cigarette drag, of course. And for all of the characters, turning a visitor’s center into the primary locus of all things Mormon is both somewhat insulting (Mormon belief is best represented through mannequins) and not reflective of the reality of Mormon life, with its web of intimate social connections. Where are the home/visiting teachers in the middle of all this? Why doesn’t Harper have a Primary calling? In short, in my view Kushner’s Mormons are stand-ins rather than representations.